Daniel Cormier and Anthony Johnson first met at UFC 187, an event which expected to see a second fight between then-champion Jon Jones and then-challenger Daniel Cormier. However, Jones was suspended indefinitely following his hit-and-run incident and stripped of the title. This resulted in a fight between Cormier and Johnson for the vacant title — a bout won by Cormier via third-round submission. A re-match between the two was set for UFC 206 back in December, but the fight was postponed after Cormier suffered an injury. The bout finally happened at UFC 210 at the KeyBank Center in Buffalo, New York, on Saturday night. Even with a full camp for Johnson, lightning struck twice for DC. Cormier submitted Johnson in the middle of the second round to retain the light heavyweight title. Johnson tried to intimidate Cormier by showing off his power, but Cormier fired back and forced Johnson into retreat. Johnson shot in for a takedown and got Cormier against the fence. Johnson got the champion down, but not before eating hard elbows. The two then had a transition battle against the cage. Both fighters eat a hard knee before they’re pulled apart and the referee warns Cormier for grabbing the fence. Johnson took Cormier down as the bell sounded to end the first. Cormier opened the second round by attempting to close the distance, and attempting to get Johnson down against a cage wall. 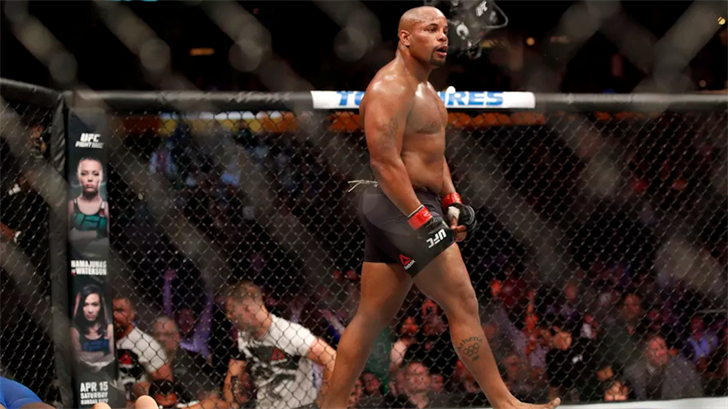 After Cormier laid in some shots against the cage wall, Johnson was able to take the champion down. Cormier, however, quickly countered and was able to get a takedown of his own. Cormier got to Johnson’s back and made the challenger eat shot after shot, with Johnson not doing much defense. Cormier got the choke and successfully retained the title. Following the bout, Johnson surprisingly announced his retirement from MMA. Johnson was not the only one to announce retirement at the event, as Patrick Cote also retired following his loss to Thiago Alves. Cormier, meanwhile, took to the mic to take shots at potential title challengers Jimi Manuwa and Jon Jones. "I can’t get cheered. Should I say this is my last fight too, Joe? Boo me! I’m getting money and championship belts!" Cormier said in the post-fight interview with Joe Rogan. "[Manuwa], you don’t went any of this. I’m not going to talk about someone [Jones] who is ineligible to fight. When he gets his s*** together, we’ll talk." Middleweights Chris Weidman and Gegard Mousasi collided in the co-main event, which featured a very controversial ending. During the second round, it appeared that Mousasi had hit Weidman with a knee when Weidman had both hands on the ground, which is illegal. Weidman stated during the break in the action he couldn’t continue the fight. Referee Dan Miragliotta, however, was corrected that the knee was actually legal — New York has adopted the new unified MMA rules, meaning one hand off the mat is legal. When Mousasi went for the second knee, he used his strength and momentum to lift one of Weidman’s hands off the mat, which the ref missed. Action should have resumed right away, but Weidman was given time to recover, which had Rogan flipping for an explanation. The fight was ultimately called and awarded to Mousasi via TKO. In the post-fight conference, Weidman pointed out that New York does not observe the use of instant replay, so Miragliotta’s first decision of an illegal knee should have stood. Weidman called for a re-match ASAP, and that is likely to happen. Performance bonuses went to Charles Oliveira, who submitted Will Brooks to start off the main pay-per-view card, and Gregor Gillespie, who knocked out Andrew Holbrook in just 21 seconds to end the UFC Fight Pass prelims. Gillespie now holds the sixth-fastest knockout in UFC history. The Fight of the Night bonus went to Shane Burgos and Charles Rosa for their bout on the Fox Sports 1 prelims.